Just like a cat or dog, your ferret friend will need vaccinations to protect her against potentially deadly diseases. Make sure your ferret visits a vet who is knowledgeable about ferrets and discuss a vaccination schedule for your pal. There are two vaccines that she'll need, canine distemper and rabies. Always consult an experienced veterinarian regarding the health and treatment of your pet. When you adopt your ferret, speak with the organization about which vaccinations your new friend already has received. They may already have given her first round of shots before you brought her home, meaning you'll only need to give her boosters. It's a good idea to keep a record of your ferret's vaccinations so you're sure to keep her up to date and protected. Ferrets are susceptible to the canine distemper virus (CDV). The distemper virus that cats get doesn't affect ferrets. CDV cannot survive more than 30 minutes outside of a sick animal, so the only way she can catch it is being around an animal who is sick with the disease. She should receive her first vaccine around 6 weeks old. Initially she'll receive 3 shots, one every 3 weeks after her first one. After she gets the first 3 vaccinations, she'll need a booster every year. Rabies is extremely rare in ferrets, but since it is so dangerous to humans it is required by law in many states. Make sure to speak with her vet about what the law requires in your area. She'll need her first vaccination at 3 months old and then she'll need an annual booster shot. Ferrets can have an allergic reaction to either vaccine, usually occurring just minutes after receiving a shot and lasting for up to 8 hours. 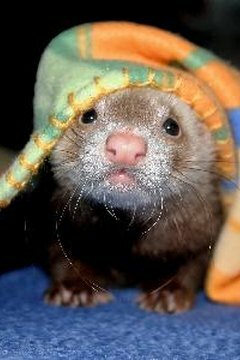 Reactions in ferrets are more common than in cats or dogs. If she has a reaction, her face will swell, she'll have diarrhea, throw up, seem listless, spike a fever and itch. If your ferret has an allergic reaction to a vaccine, she shouldn't receive the vaccine again, but make sure you keep her away from other pets to prevent her getting sick. While it can be convenient to get all her shots at once, it's safer to space out vaccinations by at least a week. Ask your vet to give her a small dose of the vaccine and see if she reacts. Her vet may go ahead and give her an antihistamine before her shot to minimize the risk of an allergic reaction. Consult with a vet about a vaccination schedule for your pet. All Creature Care: How Often Should My Ferret Receive Vaccinations? Which Ones Should I Get? Can A Dog's Heat Cycle Be Stopped With Medication?